SnugFit can be made in two fabrics: Spandex and Scuba. 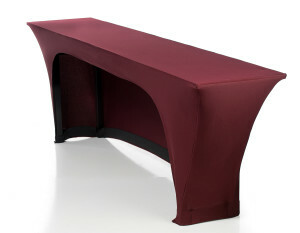 Scuba is a heavier fabric with a matte appearance. Spandex is a light fabric with a shiny finish. Spandex is a commonly used fabric for swim suits and biking shorts. Spandex is a fabric, not a style. 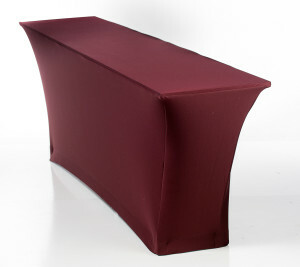 StarTex offers the lowest pricing on custom SnugFit covers proudly made in the USA. 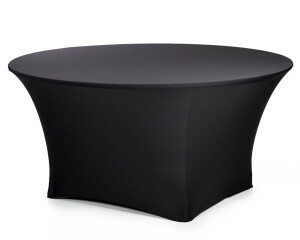 All covers come with custom designed footholds specific for your table to create the modern table silhouette. Do away with T-pins, clips and Velcro with our easy care SnugFit. 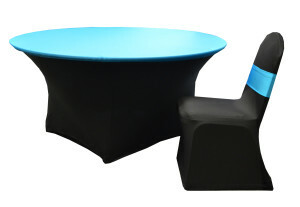 Dress up your meeting space with modern custom designed SnugFit. Open back option makes it easy and comfortable for seating. All fabrics are machine washable and wrinkle free. 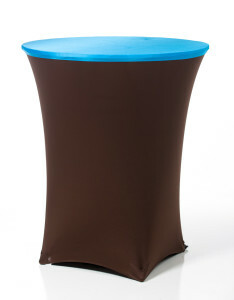 SnugFit make all of your cocktail tables the life of the party with a wide array of colors to choose from. Compliment the SnugFit cover with a colorful topper of your choice. 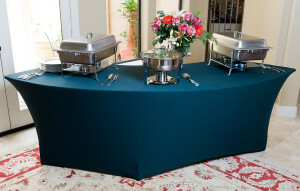 Setting up banquet rounds has never been easier with our custom SnugFit. 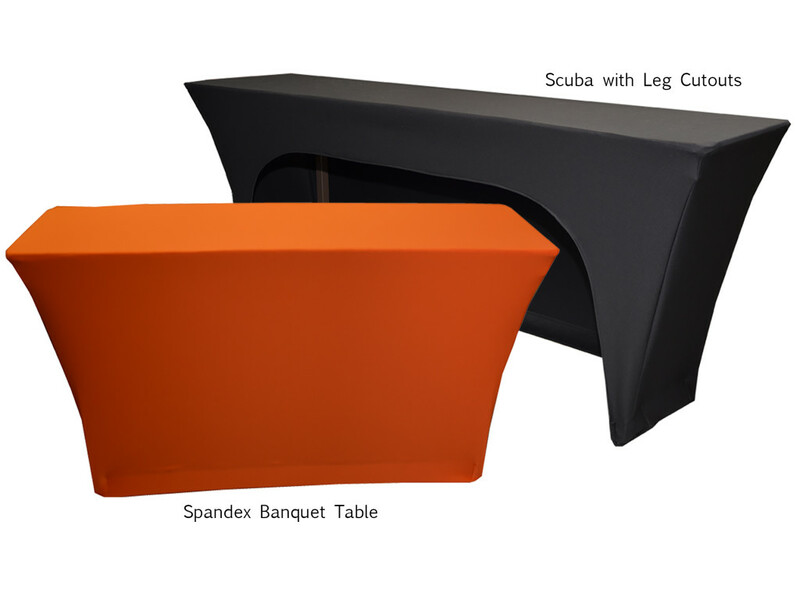 StarTex stands behind all our products with a two year workmanship guarantee and our Scuba/Spandex fabrics are the best quality on the market. No one beats our color selection. 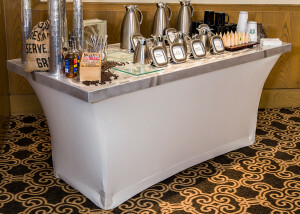 Custom leg coverings by StarTex Linen adds the finishing touch to your elegant metal top tables. 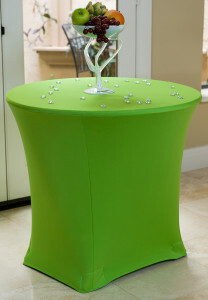 We have the largest selection of color choices to coordinate with any decor. 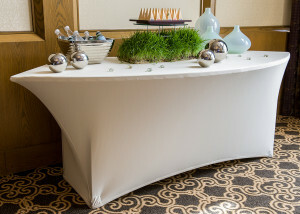 Finding custom SnugFit for your serpentine tables is easy with StarTex Linen. 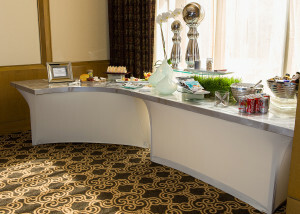 StarTex specializes in creating the perfect for serpentine tables of all changes and sizes. 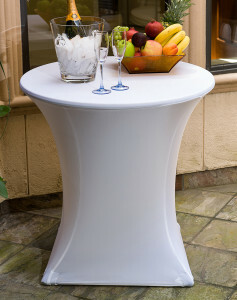 SnugFit instantly modernize the look of your tables and takes the stress out of setups.